Looks: Khaki cascade separating into black w/ ruby edges and a fine-textured pale tan head that sustains like skin on gravy. Nose: Dark chocolate with a grainy, biscuity undertone, but there are flashes of hop and ester fruitiness. Flavor: Immediate chocolate roastiness, natch; those undertones of bready-grainy malt come forth more as the beer warms (especially via foam traces in the mustache). An interesting combo of chocolate – specifically, Cadbury Dairy Milk bars – and fruity, herbal hops stronger here than in the aroma: a pretty nice if subtle complement to the roast malt. There’s a very soft dark fruit/toffee note in there too, which is in concert with the Beamish of my memory. It wraps up off-dry and bittersweet – specifically and particularly hop-bitter. It is definitely not a to-spec dry Irish stout of the Guinness mold, where the roast malt quality breaks coffee-like and burnt to the point of acrid; this roast quality is milder and less aggressive, and the added elements of fruit/herbs/toffee further make it a little more of its own thing. Definitely Irish stout-y, but with a vestigial Anglo porter tail poking out of its breeches. Texture: Creamy and dense, but without the viscosity or oily slickness of an iteration with flaked barley. The malted wheat is a subtle tweak, but it makes itself most felt here. This entry was posted in homebrew and tagged Challenger, East Kent Goldings, Hersbrucker, Irish stout, tasting notes, wheat by MD. Bookmark the permalink. Sounds like the perfect pint for a day like today. Jealous. I think one of the things I appreciate most about the recipes you post on here is their simplicity. That’s not really my style in either cooking or brewing, as I tend more toward piling on many layers, I am somewhat envious of those who can pull off perfection through extreme simplicity. How is the Patagonia dark crystal malt? I don’t have access to it locally (other than mail-order, I suppose). How does it compare to either a British Crystal 150 or Special B? I really like both of them. Also, what do you get from the Stout Malt as opposed to a Pale Ale malt? Mash at 147F, with slightly burtonized Cleveland, OH water (1.5 grams gypsum into strike water). 2.2 oz 6% EKG, (43-ish IBU), 1.063 OG, 1.018 FG. WLP002 yeast. Chocolate and fruit in the nose; flavor has a nice amount of roastiness balanced by malty sweetness with some esters. Some smoky/leathery tones. The carabrown gives just a hint of nutty graham cracker, and the black malt helps to give a little umph to the roasted barley. Cheers, Dave – that sounds like a great stout. Re: Patagonia extra dark crystal malt – it seems similar in terms of the raisiny/dark fruit character, but it is a little more austere and just a touch roasty … probably closer to the English C150. Re: Stout malt – compared to standard UK pale malts, it’s paler and higher in enzymes (for converting a large fraction of unmalted barley, I assume); in the few times I’ve brewed with it so far, I’ve gotten a bit higher extract out of it as well. If you don’t have or want a nitro setup, the posted image alone will change that. If you’ll all excuse me, I need to go buy my wife some jewelry. Coincidentally I also hooked up my keg of stout this weekend, and drank some pint to celebrate the memory of St. Patrik. My stout has a more basic grist (70% Pale, 20% Barley flakes & 10 % Roasted Barley) and I only used EK.Goldings @ 90′. Used the same yeast (British Ale II). My stout seems to have a little bit of a oak aroma, and has a real nice dry finish. I suspect this strain leaves room for the aroma hops. So next edition I will add some late editions to the mix. Do you detect any aroma or taste profile you would suspect the yeast brought to the party? I do think there’s some low- to mid-level yeast character in mine – some apple/pear tree fruit-type esters, and more in the nose than the flavor … the late hops stood out more in the flavor than the yeast did in this batch. I didn’t pick out anything oaky, but searching for it sounds like an excellent excuse to pour a pint tonight. 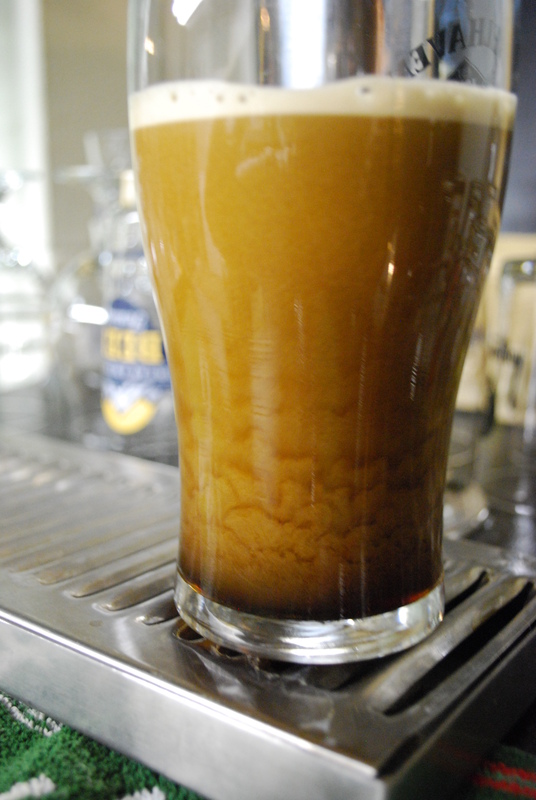 Hey Mike – would share your process for prepping a keg for nitro? I feel like every time I put a beer on nitro I am fiddling with it for days or weeks, wasting many pints before it is finally dialed in. Sure! I use a 0.5 micron diffusion stone inside the keg, on one end of about 20″ of bev tubing (for a 5 gallon keg) – the other end can either get snugged over the gas-in dip tube on the inside of the keg ceiling, or attached to a storebought or homemade carbonation lid (like this: http://morebeer.com/products/carbonating-keg-lid.html). After fining the beer and racking into the keg, I usually force carb to a low level with CO2 (<1.0 vol), then hook up the beer gas mix to the keg (pushing through diffusion stone, to help the N get into solution), and dispense at a pretty high pressure (25-35 psi) through a stout faucet. If I'm in a rush, I have been known to skip force carbing with CO2 and go straight to dispensing with beer gas at a slightly higher pressure (…for the first day or two, then turn it down to that 25-35 psi range). Thanks man, appreciate you taking the time. One more question, do you leave the diffusion stone on until you kick the keg or is that just a temporary solution? Diffusion stone stays until the beer is gone – otherwise the nitrogen portion of the blend won’t really want to go into solution. Michael Dawson…what does MCI stout malt taste like? Could it be used as a base malt in beers other than a stout? Is it clean like American two row or does it have more character like Maris Otter or other english pale malts? I would like to use it to cut MO or Golden Promise in a double IPA. If it imparts too much character I think I will use two row or pilsner malt. Aaron Wirtz … based on my experience with it, I’d describe it as midway between a domestic 2-row pale and a UK pale malt from a traditional barley: not quite as purely grainy-neutral as a US base malt, not quite as rich or intense as, say Maris Otter, Optic, Golden Promise, etc. It can definitely be used in other styles (that high yield is nice!). Thanks MD…I appreciate the info. Love your blog and videos on Brewing TV and Chop and Brew.